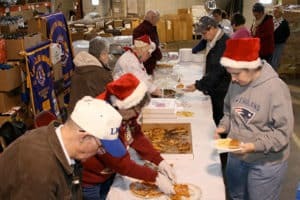 Easton and the Brockton Lions have been hosting the Brockton Area Arc Christmas Party at Shoe City in Brockton on West Chestnut Street across from White’s Bakery for many years. Preparations start at 11 AM, lunch, Santa and fun ‘til 3 PM. Easton Lion Tony Cabral is our lead on this project. The Brockton Area Arc is recognized as the premier agency for services, advocacy, and information pertaining to the needs and interests of individuals with disabilities and their families. Their mission is to work in partnership with, and for, the community to provide advocacy, information, and direct services for children and adults with intellectual and developmental disabilities, and their families. Services provide choice and empowerment while supporting individuals as they strive to realize their personal goals. The BAArc promotes independence, respect and dignity.